Sponsoring Fragapalooza 2017 is another Canadian software company Ubisoft, and we are so glad to have them with us! They've sent us some pretty neat stuff and we hope you will enjoy it! Need a place to stay while with us? 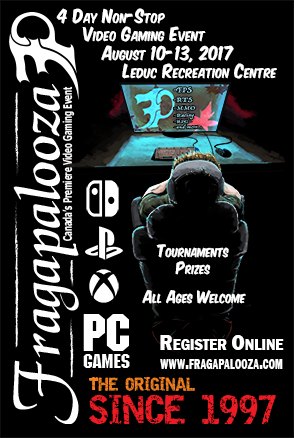 Camping - The Leduc Recreation Centre (LRC) has a camping area just North of the main building (in fact its just exactly North of the Fragapalooza Event itself! ), just within a small walking distance. The area is a Gravel section, where Garbage Bins will be provided by the LRC. While there aren't any hookup facilities, you are welcome to bring your Tents, Trailers, and RVs to stay in the area, and the Fragapalooza venue does offer Team Locker rooms with onsite showers. NOTE: this area is first come first serve, and may be shared with other events happening in the area at the same time. Hotels List - We have contacted many surrounding hotels for your convenience and put all their details in one nice PDF. Any questions feel free to contact the Hotels directly. 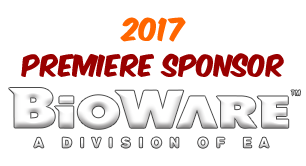 Fragapalooza is proud to announce our Premiere Sponsor for our 2017 event! Paragons (or Renegades?) of the local video game scene, there will be few among us not familiar with their works or their story. Prizes and giveaways, we are so very proud to share this opportunity with a local Edmonton based gaming company, whom supports the local gaming community events and gamers! Best known for their award winning Dragon Age and Mass Effect games and once again gearing up with their new IP Anthem, BioWare a Division of EA is coming to Fragapalooza in a BIG way this year! Please give-it-up for BioWare, through Social Media, word of mouth and any other way you can! We are proud to announce that Dell/EMC and Alienware are jointly sponsoring Fragapalooza 2017 with some great stuff. We love their products and we're sure you will too! Here it is, this year's Poster for you all to share to the world! You can also get the PDF here and the HiRes PDF here. Its the final 3 days left to get your Early Bird seats and Merchandise Pre-Orders in! Last 3 days as our July 9th, 2017 cut-off for Early Bird seat purchases and Merchandise Pre-Orders is coming up fast. We have limited seating and the only way to guarantee that seat is to get your Seat orders in and paid for asap! Looking for that T-Shirt customized with your own Gamer Tag? Need to get those Merchandise Pre-Orders in and paid before the cut-off as well to get them at the event! So head over to the Store to get those orders in and completed today! Extra Life Edmonton and Fragapalooza together again! Extra Life Edmonton is being a large part of Fragapalooza 2017 once again. They are planning to sponsor one of our Tournaments as well as have a great presence at our event. Check them out when you are there! Here is our design for this Fragapalooza 2017 event. These are pre-orders that you can pick up at the event. If you have already purchased your seat, no worries, just start a new Purchase in the Store, select your items, complete your order and we'll have it there for you at the event.